ON THIS DATE (May 8, 1946) ... The Red Sox kept their streak alive, as they ran their consecutive wins to 13 straight, by the amazing score of 14 at 10 over the Chicago White Sox at Fenway Park. Contributing to their meteoric rise was Johnny Pesky, who equaled the big league mark scoring runs in a single-game and broke the American League record. When Johnny raced home in the eighth-inning it was the sixth time he had scored. 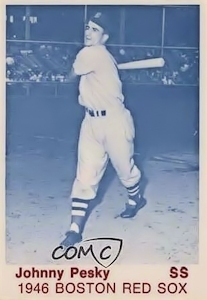 Pesky, who had only two days before, missed getting himself into baseball's record book for consecutive hits, entered really select company today, as Pesky bashed out four singles to pass his more illustrious teammate Ted Williams in the league's batting race. He reached safely on six at-bats. Each time he scored a run, such famous names as Lou Gehrig and Jimmie Foxx were in the process of being erased from the record book. The Sox chased Joe Haynes for nine hits and as many runs during less than three innings. None of his relievers could halt the Red Sox batters. All of the batters made at least one hit. Harris was the last player to get into the thick column with a single in the eighth inning, which launched a two run rally. These last two runs were probably the most interesting of the day. They included Pesky's record score, as he was driven home by Bobby Doerr, who also wrestled the league's RBI total from Ted Williams. With one out in the inning up came Pesky. He had already belted four straight hits, each one against a different pitcher. Earle Caldwell didn't take any chances and he walked Johnny. Caldwell then proceeded to strikeout Ted Williams on three straight pitches. Bobby Doerr came to the plate and Caldwell unfurled a wild pitch letting Harris go to third and Pesky the second. Bobby blasted one off the left-field fence and Harris waltzed home as Doerr tried for second. He was thrown out at second base, but Pesky touched the plate just before Doerr was nailed. So by that narrow margin, Pesky was in the record book.